Intracellular signal transduction system plays a key role in stress-induced cellular responses, including cell proliferation, apoptosis, and a variety of gene expressions. Mitogen-activated protein (MAP) kinases, including extracellular signal-regulated kinase (ERK), c-jun NH2-terminal kinase (JNK), and p38, are the major signal transduction molecules responsible for the above-mentioned cellular responses (1–3). ERK is mainly activated by growth-promoting factors and participates in cell proliferation or survival in a variety of cells. On the other hand, JNK and p38 are mainly activated by stress signals and are known to induce apoptosis in many kinds of cells (2,4,5). However, the significance of ERK, JNK, and p38 in glomerular cells remains to be well defined. Particularly, the role of JNK is poorly understood, because of the lack of the specific inhibitor. We and other groups of investigators have reported that ERK, JNK, or p38 are activated in experimental glomerular diseases, such as hypertension (6,7), diabetes mellitus (DM) (8), and glomerulonephritis (9,10). Furthermore, we have also reported that activator protein-1 (AP-1), the transcriptional factor, is activated in various experimental glomerular diseases (6,7,11). These findings support that MAP kinases and AP-1 may be involved in the pathophysiology of glomerular diseases, although the significance of activation of these three MAP kinases and AP-1 remains to be determined. Platelet-derived growth factor (PDGF)-BB is well known to be a potent mitogen for mesangial cells (MC) (12) and stimulate extracellular matrix (ECM) production in vitro, which are the key events of glomerulosclerosis (13). Glomerular PDGF-B chain and its receptor are significantly expressed in experimental glomerulonephritis (14) and human IgA nephropathy (15). Furthermore, several previous in vivo studies, including the effects of recombinant PDGF-BB infusion in rats (16), the effects of intrarenal PDGF-BB gene transfer with HVJ-liposome in rats (17), and the effects of PDGF receptor tyrosine kinase inhibitor on experimental glomerulonephritis (18), confirm that PDGF-BB plays a key role in glomerular mesangial cell proliferation and ECM accumulation in vivo. Thus, the investigation on the mechanism responsible for PDGF-induced MC proliferation and ECM accumulation is essential not only for the elucidation of the mechanism of glomerulosclerosis but also to develop new therapeutic strategies for glomerular diseases. Interestingly, PDGF-BB is reported to stimulate the gene expression of monocyte chemoattractant protein-1 (MCP-1) and transforming growth factor-β1 (TGF-β1) in MC (12). MCP-1 is a member of the chemokine family and specifically attracts monocytes (19). TGF-β1 participates in progression of glomerulosclerosis by directly enhancing mesangial cell hypertrophy and ECM production (20,21). These findings suggest that MCP-1 and TGF-β1 induction in MC may be involved in glomerular diseases. However, the molecular mechanism underlying PDGF-BB-induced MCP-1 and TGF-β1 expression is unclear. In the present study, to elucidate the role of MAP kinases and AP-1 in MC proliferation and gene expression by PDGF-BB, we used recombinant adenoviruses containing dominant negative mutants of MAP kinases and c-Jun for gene transfer to human MC. We have obtained evidence that ERK, JNK, p38, and AP-1 play differential roles in MC proliferation and gene expression by PDGF-BB. Human MC, culture medium (Mesangial Cell Basal Medium, MCBM), fetal bovine serum (FBS), and gentamicin/amphotericin-B were obtained from Clonetics (Verviers, Belgium). Human MC were cultured, according to the manufacturer’s instructions. For all experiments, MC from passages 4 to 6 were used. MC were grown to 70 to 80% confluence and then made quiescent by incubation with MCBM containing 0.1% FBS for 24 h, followed by stimulation with 30 ng/ml PDGF-BB (Genzyme/Techne). Dominant-negative mutants of ERK (DN-ERK), JNK (DN-JNK), and c-Jun (DN-c-Jun) were produced as described in our previous reports (22–24). Dominant-negative mutant of p38 (DN-p38) was produced by PCR using primers designed to produce a threonine (ACC)→alanine (GCC) substitution at threonine 180 and a tyrosine (TAC)→phenylalanine (TTC) substitution at tyrosine 182 in the phosphorylation sites of wild p38; DN-p38 had HA-tag. Recombinant adenoviruses expressing DN-ERK, DN-JNK, DN-p38, or DN-c-Jun were constructed using an Adenovirus Expression Vector Kit (Takara Biomedicals) as described in our previous report (23). Recombinant adenoviruses containing bacterial β-galactosidase gene was constructed as negative control of DN-ERK, DN-JNK, DN-p38, or DN-c-Jun in the same way. Adenoviral gene transfer to MC was carried out as described previously. Briefly, MC were incubated with the adenovirus at multiplicity of infection (MOI) of 50 in MCBM containing 0.1% FBS for 1 h and then made quiescent for 24 h before stimulation with 30 ng/ml PDGF-BB. To estimate DNA synthesis, MC in six-well plates were stimulated by PDGF-BB for 19 h and pulsed with 1 μCi/ml [3H]thymidine (Amersham) for 5 h. Cells were then washed twice with ice-cold PBS, incubated for 5 min in 5% TCA, washed by methanol, and dissolved in 99% formic acid. The incorporation of [3H]thymidine into TCA-insoluble material was measured by liquid scintillation spectrophotometer. For the assay of cell growth, MC in six-well plates were stimulated by PDGF-BB, and cell number was counted by Coulter counter (Beckman). Total RNA was isolated from treated cells by the guanidium thiocyanate-phenolchloroform method, using ISOGEN (Nippongene). Template DNA was prepared from 500 ng of total RNA by reverse transcription reactions with Omniscript Reverse Transcriptase (QIAGEN) and random hexamers. Real-time PCR was carried out with LightCycler thermal cycler system (Roche Diagnostics) (25–27). For the quantification of human MCP-1 and human TGF-β1 DNA, PCR reactions were carried out with the LightCycler FastStart Master Sybr Green I and the LightCycler Primer Set (Roche Diagnostics), according to the manufacturer’s protocol. The quantification of DNA was analyzed with the LightCycler analysis software. For the quantification of human PAI-1 and human GAPDH DNA, the primers and the fluorescein-labeled and Red 640-labeled probes were originally designed and synthesized by Nihon Gene Research Laboratories Inc (Table 1). The PCR reaction mixture consisted of 2 μl of a commercial ready-to-use reaction mix for PCR (LightCycler FastStart DNA master hybridization probes), 3 mM MgCl2, 0.5 μM primers, 0.2 μM fluorescein probes, 0.4 μM LCRed probes, and template DNA. PCR reaction with LightCycler was denaturation step at 95°C for 60 s, followed by 35 cycles of 95°C for 15 s (denaturation for the PAI-1 DNA) or 0 s (denaturation for the GAPDH DNA), 56°C (annealing for the PAI-1 DNA) or 58°C (annealing for the GAPDH DNA) for 15 s, and 72°C for 10 s (extension for the PAI-1 DNA) or 13 s (extension for the GAPDH DNA), with monitoring of fluorescence during the annealing phase. The quantification of DNA was analyzed with the LightCycler analysis software. MC protein extracts were prepared as described in detail in our previous report (28). Phosphorylated or total ERK, JNK, and p38 MAP kinase protein levels were measured with Western blot analysis, as published in detail (7). All primary antibodies used were from New England Biolab. The densities of each band were measured using the public domain NIH Image program. We examined the activity of ERK, JNK, and p38 in MC using p44/42 MAP KinaseAssay Kit, SAPK/JNK MAP Kinase Assay Kit, and p38 MAP Kinase Assay Kit (Cell Signaling Tecnology, Inc., Beverly, MA), respectively, according to the manufacturers’ protocol. For the gel mobility shift assay (EMSA), nuclear protein extracts from MC were prepared, and EMSA of AP-1 DNA binding activity was performed as described in our previous report (7). The sequence of the AP-1 consensus oligonucleotide probe, used for EMSA, was 5′-CGCTTGATGACTCAGCCGGAA-3′. A supershift assay was carried out by using rabbit polyclonal IgG against c-Fos or c-Jun (Santa Cruz Biotechnology). All data are presented as mean ± SEM. Statistical significance was determined with one-way ANOVA followed by Duncan multiple-range comparison test using Super ANOVA (Abacus Concepts, Inc). Differences were considered statistically significant at a value of P < 0.05. As shown by Western blot analyses in Figure 1A, exposure of MC to PDGF-BB (30 ng/ml) increased the phosphorylation of ERK, JNK, and p38, with the peak at 15 min by 9.2-fold, 1.9-fold, and 3.3-fold, respectively. Figure 1B shows that dominant-negative mutant induced-proteins were expressed much more than endogenous proteins. 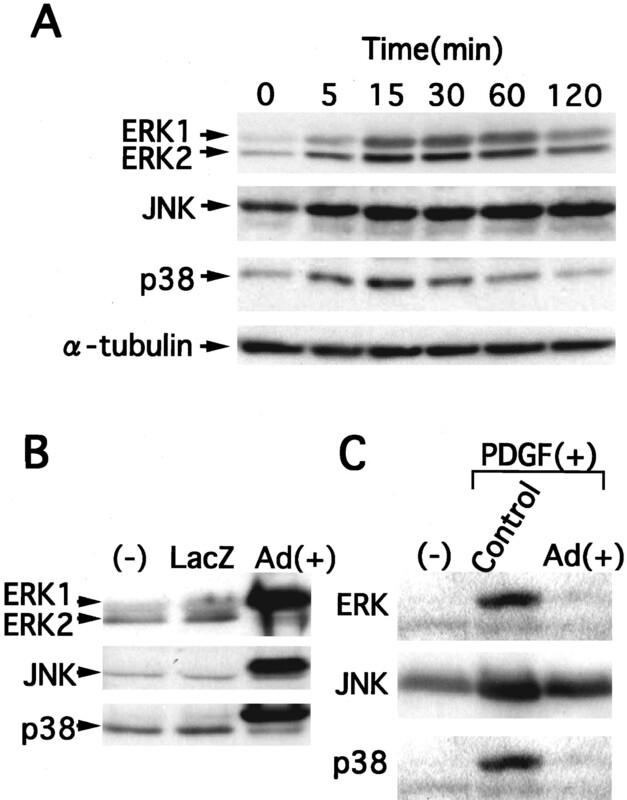 As shown by MAP kinase assay in Figure 1C, infection of MC with Ad-DN-ERK, Ad-DN-JNK, and Ad-DN-p38 significantly inhibited PDGF-BB-induced activation of ERK, JNK, and p38, respectively. Figure 1. Western blot analysis of PDGF-BB-stimulated mesangial cell (MC) protein extracts with phospho-specific MAP kinase antibody (A), Western blot analysis of dominant-negative protein expression in MC infected with Ad-DN-ERK, Ad-DN-JNK, or Ad-DN-p38 (B), and effect of DN-ERK, DN-JNK, and DN-p38 on MAP kinase activity in PDGF-BB-stimulated MC (C). (A) Phosphorylation of ERK, JNK, and p38 in MC with PDGF-BB was examined with Western blot analysis using their respective phospho-specific antibodies. (B) Protein extracts from MC infected with Ad-DN-ERK, Ad-DN-JNK, or Ad-DN-p38 at multiplicity of infection (MOI) of 50 were prepared, and Western blot analyses were performed with specific MAP kinase antibody. Protein, induced by infection of each dominant-negative mutant (Ad(+)), was expressed much more than endogenous protein. Ad-DN-JNK and Ad-DN-p38, having HA-Tag, had slightly slower migration than endogenous JNK or p38, respectively. (C) MC infected with Ad-DN-ERK, Ad-DN-JNK, or Ad-DN-p38 at MOI of 50 were stimulated by PDGF-BB (30 ng/ml; 15 min). Protein extracts (100 mg) were then prepared, and kinase assay was performed as described in Materials and Methods. ERK, JNK, and p38 in MC were activated by PDGF-BB addition, but infection with DN-ERK, DN-JNK, and DN-p38 (Ad(+)) significantly prevented the activation of ERK, JNK and p38, respectively. PDGF-BB stimulation of MC increased cell numbers at 3 d in dose-dependent manner, and the maximal proliferative effect of PDGF-BB was obtained at the concentration of 30 ng/ml. Preceding the increase in cell number, PDGF-BB (30 ng/ml) increased [3H]thymidine incorporation in MC by 5.5-fold (data not shown). Figures 2 and 3 show the effects of Ad-DN-ERK, Ad-DN-JNK, or Ad-DN-p38 on [3H]thymidine incorporation and cell number, respectively, in cultured human MC stimulated with PDGF-BB. Ad-DN-ERK and Ad-DN-JNK inhibited PDGF-BB-induced increase in [3H]tymidine incorporation by 90% and 75%, respectively (Figure 2), and also attenuated the increase in cell numbers by 77% and 56%, respectively (Figure 3). On the other hand, Ad-DN-p38 did not affect the increase in [3H]thymidine incorporation or cell numbers in MC stimulated with PDGF-BB. Figure 2. Effect of DN-ERK, DN-JNK, DN-p38, and LacZ on PDGF-BB-induced increase in [3H]thymidine incorporation. For estimation of [3H]thymidine incorporation, quiescent cells, infected with Ad-DN-ERK, Ad-DN-JNK, Ad-DN-p38, or LacZ at MOI of 50 or pretreated with PD98059 (30 nmol/ml) and SB203580 (20 nmol/ml) for 1 h were stimulated by PDGF-BB (30 ng/ml; 19 h) or not and pulsed with [3H]thymidine for 5 h. Each value represents mean ± SEM (n = 4 or 5). The data is normalized to the basal control. Figure 3. 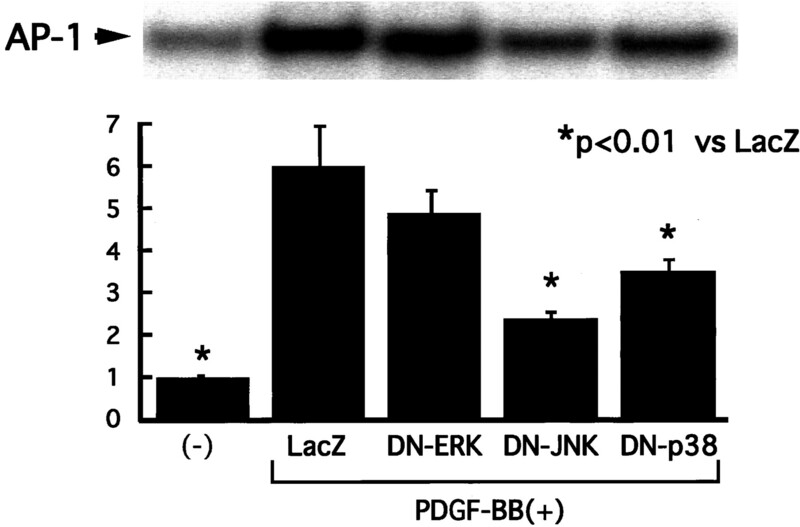 Effect of DN-ERK, DN-JNK, DN-p38, and LacZ on PDGF-BB-induced increase in cell number. For estimation of cell number, MC infected with Ad-DN-ERK, Ad-DN-JNK, Ad-DN-p38, or Ad-LacZ at MOI of 50 or pretreated with PD98059 (30 nmol/ml) and SB203580 (20 nmol/ml) for 1 h were treated with PDGF-BB (30 ng/ml; 72 h) or not, and then cell number was counted. Each value represents mean ± SEM (n = 6). The data is normalized to the basal control. At basal state, Ad-DN-ERK, Ad-DN-JNK, or Ad-DN-p38 infection of MC did not have a statistically significant effect on the [3H]thymidine incorporation or the cell numbers (Figures 2 and 3). Moreover, Figures 2 and 3 show the effects of the MEK inhibitor (PD98059) or p38 inhibitor (SB203580) on [3H]thymidine incorporation and cell number in cultured human MC stimulated with PDGF-BB. 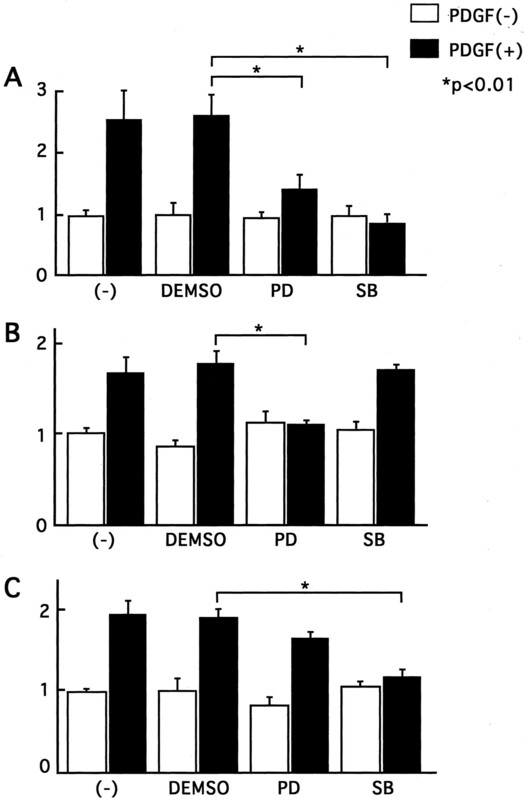 PD98059 and SB203580 inhibited PDGF-BB-induced increase in [3H]tymidine incorporation by 96% and 45%, respectively (Figure 2), and also attenuated the increase in cell numbers by 100% and 48%, respectively (Figure 3). PDGF-BB stimulation of MC increased the expression of MCP-1, PAI-1, and TGF-β1 mRNAs with the peak at 6 h by 3.5-fold, 2.1-fold, and 1.6-fold, respectively (Figure 4). Figure 5 indicates the effect of each dominant negative mutant gene transfer on PDGF-BB-induced gene expressions. The infection of MC with Ad-DN-ERK, Ad-DN-JNK, and Ad-DN-p38 significantly abrogated the PDGF-BB-induced expression of MCP-1 mRNA by 100%, 70%, and 65%, respectively (Figure 5A). Ad-DN-ERK, but not Ad-DN-JNK or Ad-DN-p38, significantly suppressed PDGF-BB-induced PAI-1 mRNA expression by 90% (Figure 5B). On the other hand, Ad-DN-JNK and Ad-DN-p38, but not Ad-DN-ERK, significantly inhibited the PDGF-BB-induced TGF-β1 expression by 38% and 76%, respectively (Figure 5C). At basal state, Ad-DN-ERK, Ad-DN-JNK, and Ad-DN-p38 did not significantly influence the three gene expressions in MC. Figure 4. Induction of MCP-1, PAI-1, and TGF-β1 mRNAs in MC with PDGF-BB. MC were stimulated by PDGF-BB (30 ng/ml; 6 h). Total RNA were prepared, and MCP-1, PAI-1, and TGF-β1 mRNAs levels were quantified by real-time PCR, as described in Materials and Methods. Each value represents mean ± SEM (n = 4). The data is normalized to the basal control. Figure 5. Effect of DN-ERK, DN-JNK, DN-p38, and LacZ on PDGF-BB-induced gene expression of MCP-1 (A), PAI-1 (B), and TGF-β1 (C). MC infected with Ad-DN-ERK, Ad-DN-JNK, or Ad-DN-p38 at MOI of 50 were stimulated by PDGF-BB (30 ng/ml; 6 hours) or not, and total RNA was then prepared, followed by the quantification of MCP-1, PAI-1, and TGF-β1 mRNAs by real-time PCR. Each value represents mean ± SEM (n = 4). The data is normalized to the basal control. We also examined the effect of PD98059 and SB203580 on gene expressions in MC (Figure 6). PD98059 treatment prevented the induction of MCP-1 and PAI-1 mRNAs in MC, but did not TGF-β1 mRNA, whereas SB203580 inhibited PDGF-BB-induced induction of MCP-1 and TGF-β1 mRNAs, but not PAI-1 mRNA. Figure 6. 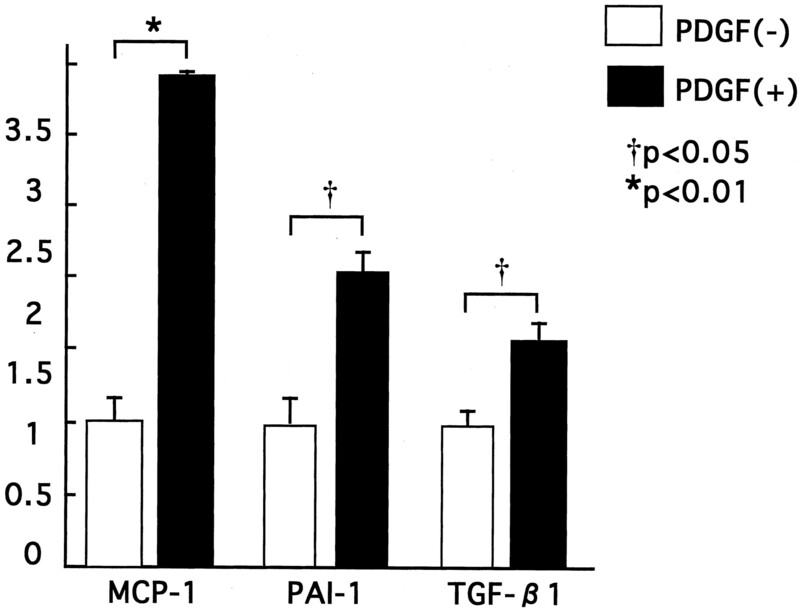 Effect of PD98059 and SB203580 on PDGF-BB-induced gene expression of MCP-1 (A), PAI (B), and TGF-β1 (C). MC pretreated with PD98059 (30 nmol/ml) and SB203580 (20 nmol/ml) for 1 h were stimulated by PDGF-BB (30 ng/ml; 6 h) or not. Each value represents mean ± SEM (n = 4). The data is normalized to the basal control. Stimulation with PDGF-BB significantly increased AP-1 DNA binding activity in MC, with the peak at 3 h by 7.5-fold (Figure 7A). Supershift analysis exhibited that AP-1 was composed of c-Fos and c-Jun (Figure 7A). As shown by Figure 7B, Ad-DN-c-Jun infection of MC enhanced AP-1 DNA binding activity. However, the position of AP-1 band due to Ad-DN-c-Jun was slightly higher than that of endogeneous AP-1 band. As indicated by supershift analysis, Ad-DN-c-Jun-induced AP-1 band was supershifted with antibodies recognizing the carboxyl portion of c-Jun, but not with antibodies recognizing the aminoterminal portion (including the transactivation domain) of c-Jun. 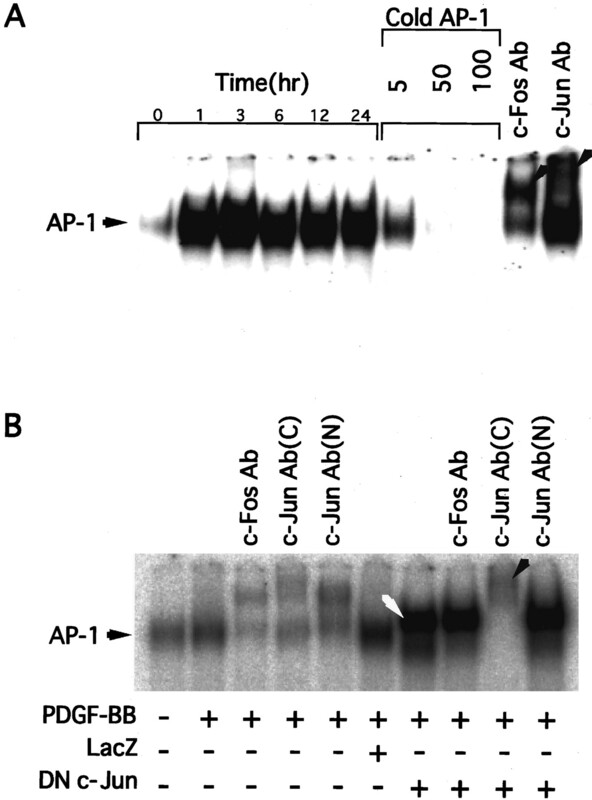 Anti-c-Fos antibody did not cause the supershift of AP-1 due to Ad-DN-c-Jun. These results are in good agreement with the previous reports by other investigators (22) or by us (24). Figure 7. Characteristics of AP-1 DNA binding activity from PDGF-BB-stimulated MC subjected to Ad-DN-c-Jun gene transfer. (A) EMSA of nuclear extracts from MC at 0, 1, 3, 6, 12, and 24 h after PDGF-BB stimulation. PDGF-BB increased AP-1 DNA binding activity. A competition assay for AP-1 was carried out in the presence of 5-, 50- and 100-fold molar excess of unlabeled AP-1 oligonucleotide competitor. Supershift analysis was performed with specific anti-c-Fos (c-Fos Ab) and anti-c-Jun antibodies (c-Jun Ab). Closed arrows indicate supper-shifted band. (B) Characteristics of AP-1 DNA binding activity induced by Ad-DN-c-Jun gene transfer in MC. MC infected with DN-c-Jun or LacZ at MOI of 50 were stimulated by PDGF-BB (30 ng/ml; 3 h), and nuclear protein extracts were prepared, followed by EMSA. Open arrow indicates AP-1 DNA binding activity due to Ad-DN-c-Jun. Supershift analysis was performed with specific anti-c-Fos antibody, or anti-c-Jun antibody recognizing the carboxyl terminus and the aminoterminus of c-Jun (c-Jun Ab(C) and c-Jun Ab(N) antibodies, respectively). Closed arrow indicates supershifted band by c-Jun Ab(C). Ad-DN-c-Jun infection inhibited PDGF-BB-induced increase in [3H]thymidine incorporation by 28.8% and also attenuated the increase in cell number by 70.5% (Figure 8). Ad-DN-c-Jun infection completely inhibited PDGF-BB-induced gene expression of MCP-1, PAI-1, and TGF-β1 (Figure 9). Interestingly, DN-c-jun inhibited the PDGF-BB-stimulated increase in cell number to more extent than the increase in tymidine incorporation. This result suggests that c-Jun has an even greater effect on mitosis than DNA synthesis. However, further study is needed to elucidate this point. Figure 8. 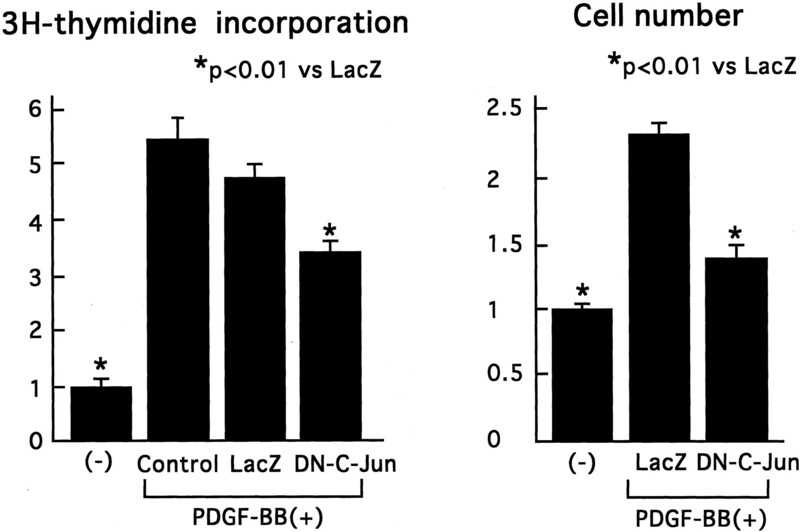 Effect of DN-c-Jun or LacZ on PDGF-BB-induced increase in [3H]thymidine incorporation and cell number. (Left) Quiescent cells infected with Ad-DN-c-Jun or Ad-LacZ at MOI of 50 were stimulated by PDGF-BB (30 ng/ml; 19 h) to estimate [3H]thymidine incorporation. Ad-DN-c-Jun infection did not influence [3H]thymidine incorporation at basal state. (Right) MC infected with Ad-DN-c-Jun or Ad-LacZ at MOI of 50 were treated with PDGF-BB (30 ng/ml; 72 h) to estimate cell number. Ad-DN-c-Jun infection did not influence cell number at basal state. Each value represents mean ± SEM (n = 4). The data is normalized to the basal control. Figure 9. Effect of DN-c-Jun or LacZ on PDGF-BB-induced gene expression of MCP-1, PAI-1, and TGF-β1. MC infected with Ad-DN-c-Jun or Ad-LacZ were stimulated by PDGF-BB (30 ng/ml; 6 h), followed by real-time PCR. Ad-DN-c-Jun infection did not influence gene expressions of MCP-1, PAI-1, and TGF-β1 at basal state. Each value represents mean ± SEM (n = 4). The data is normalized to the basal control. As shown in Figure 10, infection of MC with Ad-DN-JNK and Ad-DN-p38 decreased PDGF-BB-induced AP-1 activation by 72.4% and 50.3%, respectively. However, PDGF-BB-induced AP-1 activation was not significantly suppressed by Ad-DN-ERK. Figure 10. Effect of DN-ERK, DN-JNK, and DN-p38 on AP-1 DNA binding activity. Nuclear extracts were prepared from MC, infected with Ad-DN-ERK, Ad-DN-JNK, Ad-DN-p38, or Ad-LacZ, and subsequently stimulated by PDGF-BB (30 ng/ml; 3 h), and EMSA was performed with double-stranded consensus oligonucleotide AP-1. Bar graph shows the density of autoradiograms, which were quantified by using an imaging analyzer as described in Materials and Methods. At basal state, Ad-DN-ERK, Ad-DN-JNK, or Ad-DN-p38 did not significantly influence AP-1 activity in MC. Each value represents the mean ± SEM (n = 4). The data is normalized to the basal control. Recently, MAP kinases have been supposed to play an important role in the pathophysiology of glomerular diseases (2,13). However, the significance of MAP kinases, particularly JNK, in glomerular diseases is unclear. In most previous studies, the role of ERK has been examined by using a MEK inhibitor, PD98059, and the role of p38 has been examined with SB203580. However, it is still controversial whether these compounds are indeed specific for ERK or p38 cascade or not. Furthermore, importantly, in JNK there is presently no available specific inhibitor for JNK, which has hampered the investigation on the biologic role of JNK. To overcome these problems in the present study, we employed gene transfer technique of dominant negative mutants of MAP kinases with adenoviral vector to inhibit each MAP kinase activation in human MC. Being in good agreement with our previous report on cultured vascular smooth muscle cells (23), adenoviral gene transfer of DN-ERK, DN-JNK, and DN-p38 to human MC suppressed PDGF-induced activation of ERK, JNK, and p38, respectively, indicating the successful gene transfer technique. Glomerulosclerosis, associated with MC proliferation and excessive accumulation of extracellular matrix (ECM) proteins, is the common pathologic feature of glomerular disease due to DM, hypertension, and inflammation (29). Glomerulosclerosis then ultimately leads to renal failure (29). Thus, suppression of mesangial overgrowth may be clinically important to prevent renal failure. For that reason, the elucidation of glomerular intracellular signal transduction molecules, leading to mesangial overgrowth, is essential to develop treatment for glomerular diseases. Three MAP kinases, including ERK, JNK, and p38, play a crucial role in cell survival, proliferation, and apoptosis (1,2,4,30). ERK activation is generally associated with cell proliferation. On the other hand, the activation of JNK or p38 leads in most cases to cell apoptosis rather than cell proliferation (1,5). In this work, PDGF-BB activated ERK, JNK, and p38 in MC, preceding MC proliferation. Of note is the observation that Ad-DN-JNK inhibited PDGF-BB-induced MC proliferation, providing the first evidence that JNK participates in PDGF-BB-induced MC proliferation. On the other hand, Ad-DN-p38 did not inhibit MC proliferation, indicating the differential role of p38 from JNK. Although SB203580 showed a slight suppression of MC proliferation differing from Ad-DN-p38, this effect seems to be due to its nonspecific effect, because Ad-DN-p38 exhibited the specific inhibition of p38 as shown by the complete inhibition of p38 (Figure 1C) and no inhibition of ERK or JNK (data not shown). 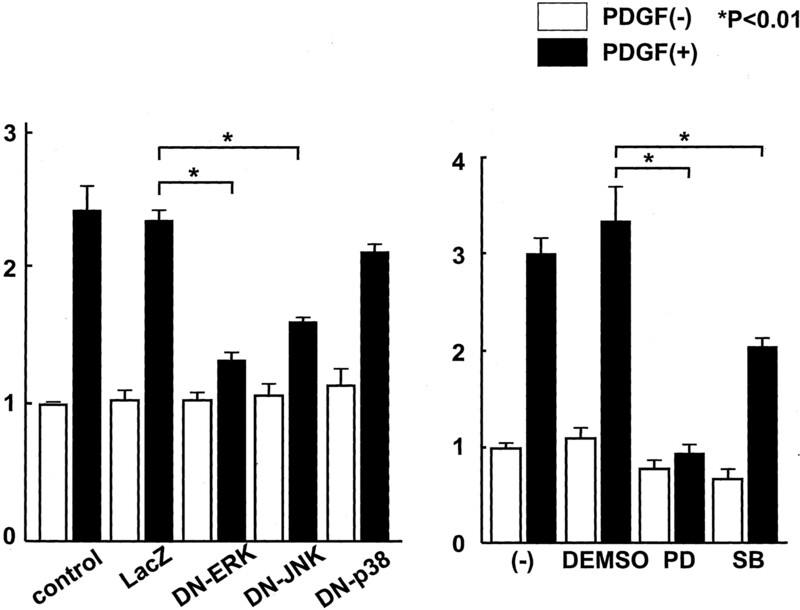 Furthermore, as shown by the inhibition of PDGF-BB-induced MC proliferation by Ad-DN-ERK, ERK is involved in MC proliferation by PDGF-BB, being consistent with the findings in other types of cultured cells (1). Thus, JNK, as well as ERK, is involved in MC proliferation by PDGF-BB. The effect of the three dominant-negative MAP kinases on MC proliferation appeared to be specific for PDGF-BB stimulation, as they had no significant effect on MC under the basal state. Moreover, the downstream cascades responsible for MC proliferation seem to differ between ERK and JNK, because Ad-DN-ERK and Ad-DN-JNK did not alter the activity of JNK and ERK, respectively (data not shown). Using constitutive active form of MAP kinases will be useful to further elucidate the detailed molecular mechanism underlying ERK or JNK-induced MC proliferation. PDGF-BB causes not only MC proliferation but also glomerular matrix expansion via upregulation of TGF-β1 (12). In vivo transfection of TGF-β gene into rat kidneys results in glomerular ECM accumulation (17). Administration of a neutral antibody against TGF-β1 to experimental glomerulonephritic rats (31) leads to the prevention of glomerulosclerosis. Thus, TGF-β1 plays the key role in glomerular ECM accumulation and the subsequent development of glomerulosclerosis. Therefore, in this study, we investigated the role of MAP kinases in PDGF-B-induced TGF-β1 expression in human MC. Elevated expression of TGF-β1 with PDGF-BB stimulation was significantly inhibited by DN-JNK and DN-p38, but not DN-ERK. Our results showed that PDGF-BB-induced TGF-β1 expression in MC was mediated by JNK or p38 but not by ERK. In this study, we also compared the effects of PD98059 (MEK inhibitor) and SB203580 (p38 inhibitor) with those of DN-ERK and DN-p38, respectively, and found that the effects of these compounds on TGF-β1 expression in MC (Figure 5) were similar to those of the dominant negative mutants (Figure 4), confirming our findings. Increased glomerular PAI-1 levels are reported in experimental glomerular diseases (32,33), which are known to result in mesangial matrix accumulation. In addition, previous reports suggest that TGF-β1-induced inhibition of ECM degradation by MC is mediated by enhanced production of PAI-1 (34–36). Thus, increased PAI-1 is also thought to participate in ECM accumulation. In this study, we found that PDGF-BB treatment of MC increased PAI-1 mRNA expression (Figure 3), and PAI-1 expression was suppressed by DN-ERK as well as PD98059 but not by DN-JNK, DN-p38, or SB203580. These results showed that ERK, but not JNK and p38, contributed to PAI-1 expression in MC by PDGF-BB. During glomerulonephritis, infiltration of monocytes/macrophages is a common pathologic feature (37), and expression of MCP-1, a chemoattractant for macrophages, is observed in the mesangial region (38–40). From this viewpoint, the inhibition of MCP-1 may be useful for therapy of glomerulonephritis. In this study, using transfection of dominant negative mutants, we obtained evidence that PDGF-BB-induced induction of MCP-1 mRNA in MC was due to ERK, JNK, and p38, as shown by the inhibition of MCP-1 mRNA expression by DN-ERK, DN-JNK, DN-p38, PD98059, or SB203580. Collectively, these findings provide evidence that the PDGF-BB-induced expression of genes for TGF-β1, PAI-1, and MCP-1 in MC each required a different pattern of activation of ERK, JNK, and p38. We previously reported that glomerular AP-1 is enhanced in experimental glomerular diseases (6,7,11). AP-1 is known to participate in diverse functions such as cell survival, proliferation, and apoptosis (41). Furthermore, AP-1 is known to be activated by MAP kinases (42). Therefore, in the present study, we also examined the role of AP-1 in PDGF-BB-induced MC proliferation and gene expressions. As shown by supershift analysis in Figure 6, AP-1 activity induced by PDGF-BB in MC was composed of c-Jun and c-Fos. Therefore, to inhibit AP-1 activity, we infected human MC with adenoviral DN-c-Jun. We have previously reported that DN-c-Jun can specifically inhibit AP-1 transcriptional activity (24), and Figure 6 confirms the successful expression of DN-c-Jun in MC. As shown in Figures 7 and 8, our work provided the first evidence that c-Jun participated in PDGF-BB-induced MC proliferation and gene expression of TGF-β1, PAI-1, and MCP-1. It is thus conceivable that the activation of AP-1 in MC by PDGF-BB may play a pivotal role in the pathophysiology of glomerular diseases. To further examine the possible link between MAP kinases and AP-1, we examined the effects of dominant negative mutants of MAP kinases on AP-1 activation by PDGF-BB, and we found that DN-JNK and DN-p38, but not DN-ERK, partially but significantly prevented AP-1 activation by PDGF-BB. These results indicated that AP-1 activation by PDGF-BB in MC is partially mediated by JNK and p38, but not by ERK. Thus, PDGF-BB-induced AP-1 activation in MC seems to involve other signaling cascades in addition to MAP kinases, although further study is needed to elucidate this point. In conclusion, using gene transfer of adenoviral vectors containing dominant negative mutants of MAP kinases and c-Jun, we examined the role of ERK, JNK, p38, and AP-1 in PDGF-BB-induced MC proliferation and gene expression of TGF-β1, PAI-1, and MCP-1. Our work provided the first evidence that three MAP kinases and AP-1 play differential roles in MC proliferation and gene expression. We propose that MAP kinases and AP-1 may be new therapeutic targets for treatment of glomerular diseases. This work was supported by a Grant-in-Aid for Scientific Research from the Ministry of Education, Science, Sports and Culture, and Hoh-ansha Foundation.